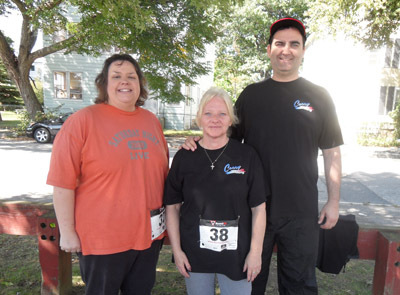 Employees from Curry Printing showed their support for The Bridge of Central Massachusetts by participating in their second annual Bridgefest, a festival to benefit the organization and its members. Bridgefest is a fun, family and community event that includes a 5K run/walk, food, arts & crafts fair, kids’ activities, pet activities, raffle and live performances. It was held on Saturday, September 22nd outside the company’s headquarters in Worcester. The Bridge of Central Massachusetts was established in 1973 and serves individuals who are at risk of being excluded from mainstream society including emotionally and behaviorally challenged children, adolescents, transition age youth and their families; and adults with major mental health challenges and/or developmental disabilities. They also operate a program for homeless individuals, a residential program for head-injured, physically challenged women and a drop-in center and outreach program for gay, lesbian, bisexual, transgender and questioning youth. Michelle Baronas, a customer service representative at Curry who helped organize their involvement in the event said, “The Bridge is a great organization that really cares about its mission and supporting all of its members. Team Curry really enjoyed our experience at Bridgefest 2012 and we are excited to have helped raise money for such a worthwhile cause.” Baronas also volunteers weekly at The Bridge at one of its drop-in centers. Besides employee participation and fundraising, Curry Printing also helped sponsor the event. Curry Printing is a privately-held company providing printing and digital services since 1978. Curry helps The Bridge with their print communications and is currently developing the organization’s mobile website.